TrueLumen 54W Actinic High Output T5 Lamp. 45.75 inches from end of pin to end of pin (for 48 inch fixtures/retrofits). 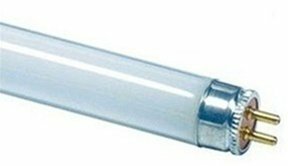 Recommended by Current USA as a replacement for the discontinued Current USA Replacement SlimPaq 45.75 inch, Actinic, 54 Watt T5 HO Fluorescent Lamp (2135). 460nm Actinic Blue. The TrueLumen T5 bulbs will work in any T5 fixture, as long as you are using bulbs of the same wattage and length as those currently in your fixture. If you have any questions about this product by TrueLumen, contact us by completing and submitting the form below. If you are looking for a specif part number, please include it with your message.